One of the largest diamonds in world history has been mined in the southern Africa kingdom of Lesotho. The gem, equivalent to 182 grams and roughly the size of two golf balls, was recovered in Lesotho’s historically-productive Letšeng mine, according to United Kingdom-based Gem Diamonds. 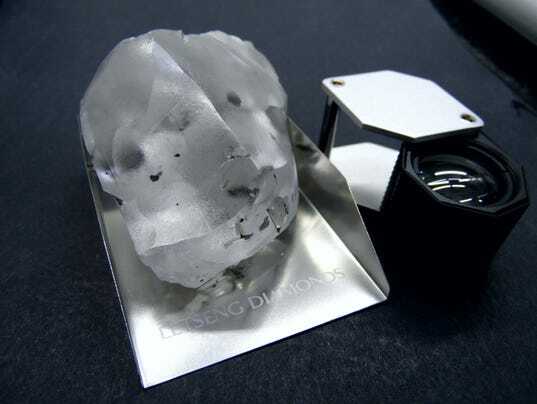 The stone is believed to be the fifth-largest diamond ever recovered in world history. It is a D color Type IIa diamond, which means the gem has little to no nitrogen atoms and is among the highest quality and expensive stones, Bloomberg News reported. The Letšeng mine is famed for recovery of large, top-color, exceptional white diamonds, making it the highest dollar per carat kimberlite diamond mine in the world, Gem said. Since 2006, the mine has been the recovery site for seven other diamonds of 299 carats or more in size. The finds include the 603-carat Lesotho Promise, recovered in 2006. Gem sold a 357-carat diamond found at the Letšeng mine for $19.3 million in September 2015. Gem Diamonds did not disclose the estimated value of the 910-carat stone or reveal how the gem would be marketed and sold. The largest diamond ever discovered is the 3,106-carat Cullinan, found in 1905 near Pretoria, South Africa.